Responsible for arranging your establishment’s official and ceremonial items? Shaw’s have been supplying jewels, badges and hand-illuminated documents to learned organisations and institutions, livery companies, clubs and fraternal societies since 1750. Over the centuries, we have accumulated a wealth of product knowledge and production techniques which we can use to help you to achieve the artefact you envisage, however sketchy your initial thoughts. Whatever you need, we can produce – in whatever quantity you require. Our new brochure brings together for the first time in our long history our entire bespoke and traditional item offering, and which is illustrated by many artefacts from projects we have completed recently. You will no doubt often have requirements for such ceremonial and presentational items; therefore we are sure our brochure will be of great interest to you. You will see from the enclosed brochure that our expertise is not limited to civic or official insignia, such as chains and badges of office, or for hand-illuminated scrolls. 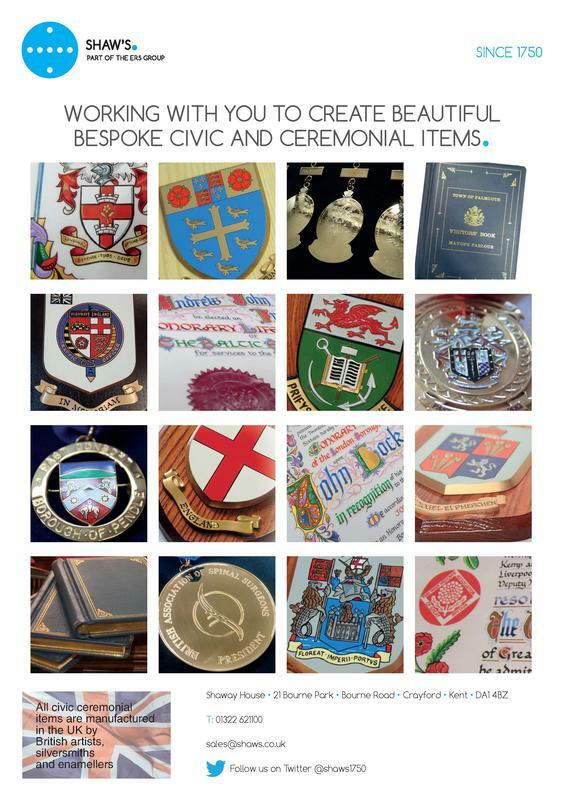 In fact, we have access to extensive records and a team of expert craftsmen who can create and deliver a wide variety of other products and services which are often required for civic, ceremonial, tradition and presentational purposes.